When digging through German TV data, Parrot Analytics discovered an unusual one: the country's weakness for David Hasselhoff lives on to this day! This is the latest in a series of posts from Parrot Analytics, looking at which content is most in-demand in key global territories. Germany’s love of US actor David Hasselhoff has been a well-known phenomenon in the entertainment world since the 1980s. While it’s commonly agreed that his popularity in Germany is mostly due to his singing career – like his iconic concerts around the fall of the Berlin Wall – a deep love of his 80s and 90s action series Knight Rider and Baywatch still endures in the country today. Parrot Analytics delves into these two series’ demand data to find out just how much love there is! David Hasselhoff has appeared in multiple shows over his career: his singing talents led him to a judge position on both NBC’s America’s Got Talent and ITV’s Britain’s Got Talent, he competed on Dancing With The Stars on ABC and even poked fun at himself with a reality mockumentary called Hoff The Record for British specialty channel Dave. However, the roles he is undoubtedly best known for is as the leading man in two major series: Knight Rider, which originally ran from 1982 to 1986 on NBC; and Baywatch, which originally aired in 1989 on NBC. Baywatch only lasted a series before NBC cancelled it, but the show was revived for syndication after that by Hasselhoff himself; it went on to last another decade. To begin the analysis, we will now check how much more popular these two shows are in Germany than in the US, the country they originated in. It is clear that both series have more lasting popularity in Germany. Knight Rider is 2.6 times more in demand in Germany than it is in the US, while Baywatch is 1.8 times more popular. The latter show may have been experiencing a boost because the Baywatch film starring Dwayne Johnson – and featuring a Hasselhoff cameo – was released in December 2017 and people in both countries were likely inspired to revisit the original show, but it is still more popular with German audiences. Are Germans the biggest fans of these shows? 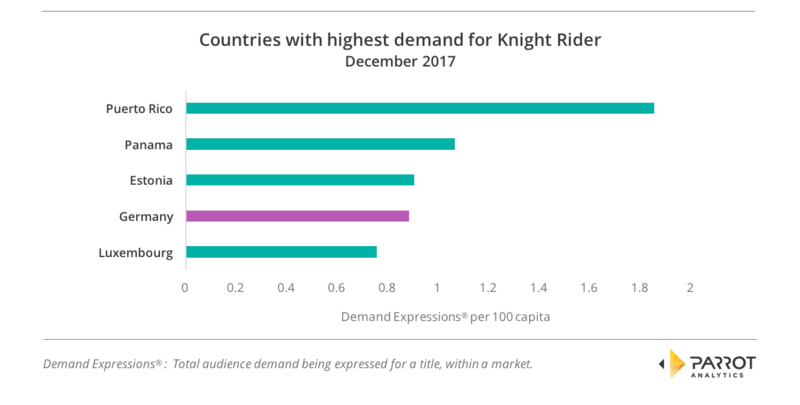 While Germany clearly has much more affection for Baywatch and Knight Rider than America does, we looked at the numbers for every country in the world to see if German audiences still lead the world in demand for David Hasselhoff action shows. For Baywatch, Germany was actually third in the world over December 2017 behind South Africa and Romania. Germans should not give up hope though, South Africa only has a 3% lead, should Germans want to reclaim their crown! For Knight Rider, there is stiffer competition. Germany was fourth in the world in demand for this show last month and Puerto Rico has over twice the demand per capita that Germany does. However, it is easy to see the appeal of Knight Rider to Puerto Rico; a country still recovering from a hurricane could really use a hero with a fantastic car that can solve any problem. We find therefore that the phenomenon is fully backed up by the data: Germany does love the TV action series of David Hasselhoff, and it is one of the top countries in the world in this love.